Sorry if it's against the rules making a c-c-combo post I just didn't want to spam 5 threads all at once. 4. Direction of belt ghost. 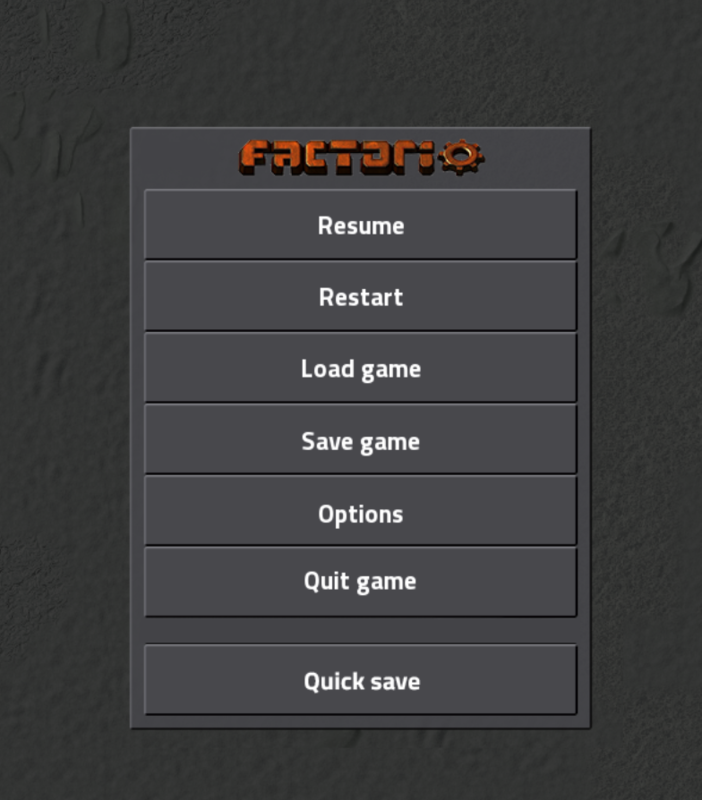 in addition a "quick save" button to save the game. I tend to save often and keep my auto save lower in case something catastrophic happens. Chaging the color of different Turrets to show what kind of turret/ranges. 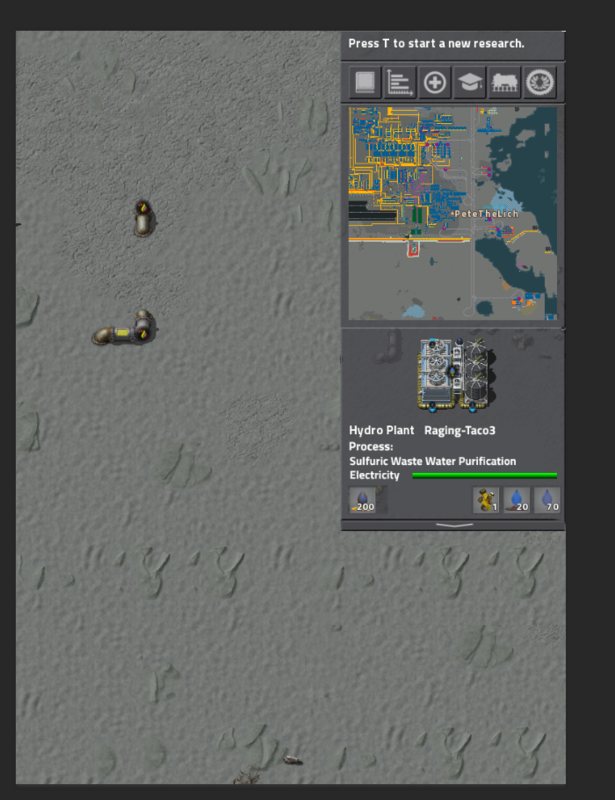 Flamethrower turrets do not have to have the flair since im sure the range indicator is drawn mathmatically. 3. When attempting to save over a different save give a confirmation notice. but also expands to give details. (Double-)Click on mod dependencies enables this dependency. PeteTheLich wrote: Sorry if it's against the rules making a c-c-combo post I just didn't want to spam 5 threads all at once. Bah it's OK. Idea compilations are just motsly a waste of time for the OP, because in spite of all the hard work, they're usually not usable. discussions turn into a cacophony, every contributor to the topic commenting a different part of the OP. Such topic usually get lost quickly in the depths of the suggestions subforum. But it's not a crime . 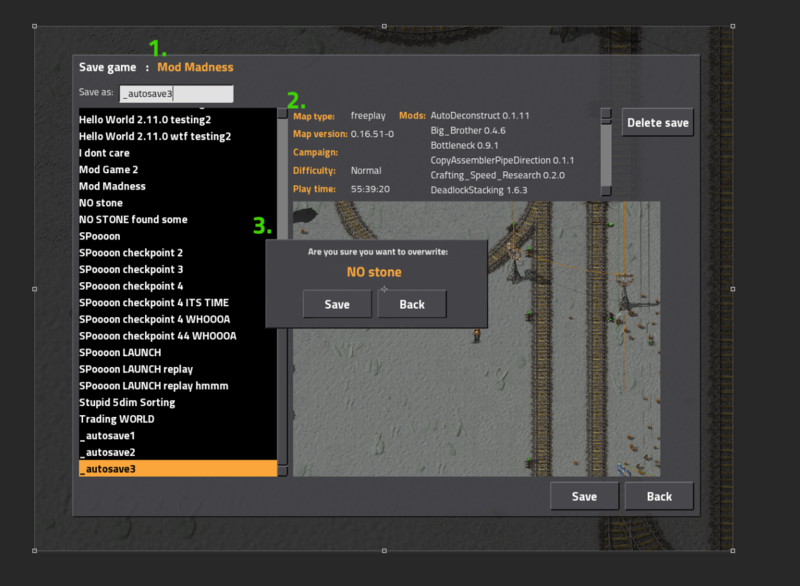 A dedicated quicksave button and/or hotkey is almost never a bad idea. As for the logo needing to be on the game menu, I'll reserve judgement until I see what the menu looks like post-GUI-update. Useful, but hard to pull off for densely-packed turrets while still making it look good. Agreed. Realizing you've just laid a hundred tiles of belt that are facing the wrong way is one of life's little miseries. Not sure how that one would work. 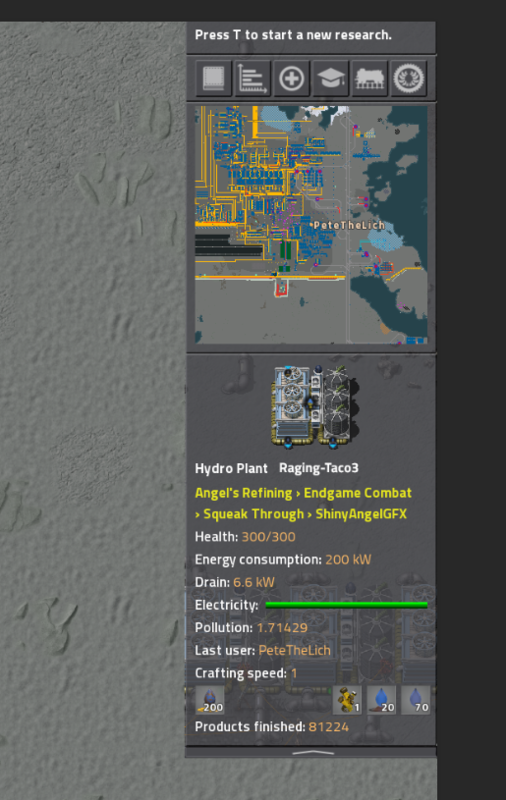 If the sidebar displays info for what's under your mouse cursor, how would you click on the dropdown? 1. well the menu is just kind of strange stating "Game"
so changing to Factroio would be a nice touch in my opinion. The quick save just protects me from myself by not giving me the opportunity to overwrite my saves. 2. I dont imagine it would hardly change since dense turrets would just be a solid color and all the turrets. 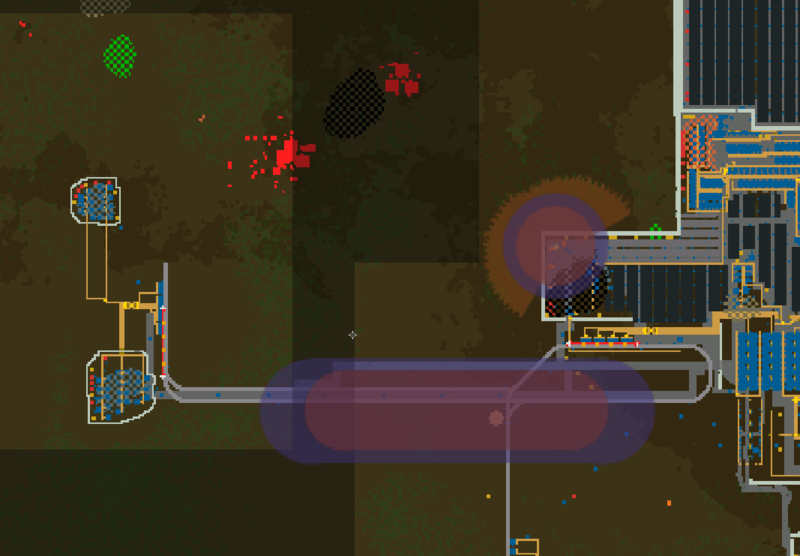 Im not sure how it would turn out with many turrets at different ranges behind the wall. 5. 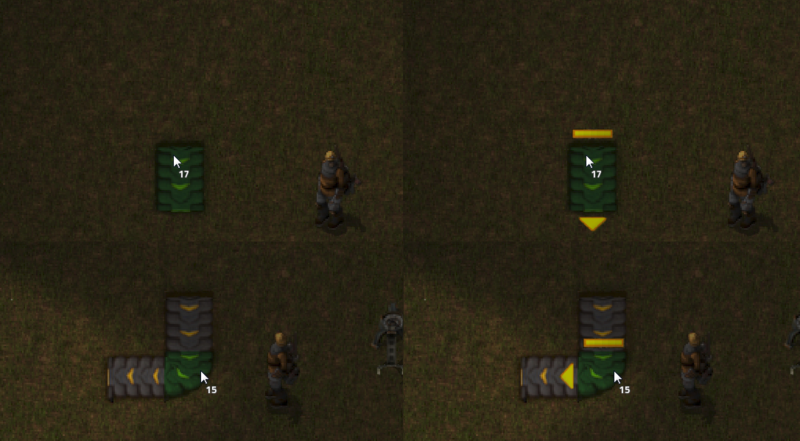 I would imagine it would be a ON/OFF for ALL machines and it could be something like the inserter arrows where if you want the details pane always visable it can be enabled. I love the idea of having belt direction indicators. Oddly enough, I like all of the proposed ideas. Especially collapsing the side bar. I had many times when it randomly intervened with my work by hiding buildings I needed, so I had to move the character. Very annoying!